Given the circumstances & hunger, ‘Loetje’ was more of a last resort than a first resort. The restaurant sitting on a picturesque canal, with outside seating gave off a pleasant vibe, but being directly below the central station in the centre of Amsterdam gave off a more touristy feel. Don’t let this fool you. The very fast service meant we were seated quickly, and before I knew I had a beer in my grasp, (Heineken to be specific). I like this. 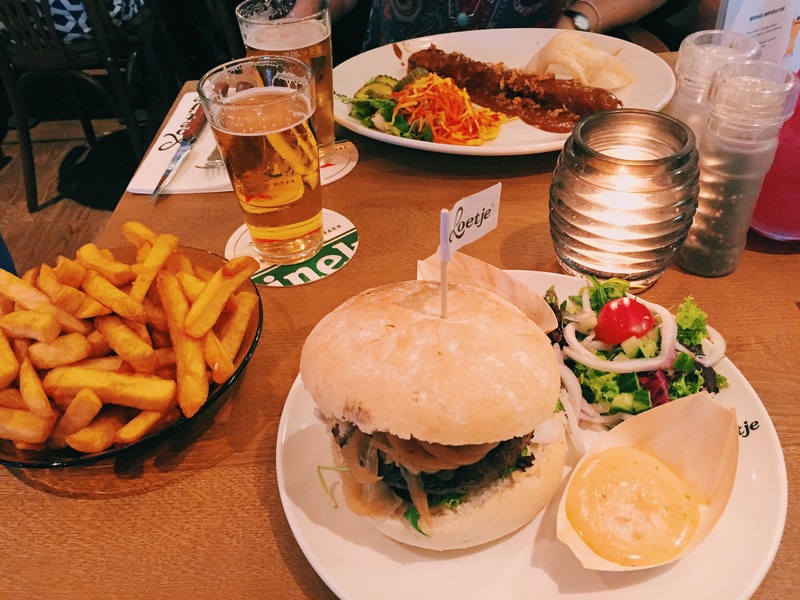 The burger I had chosen had minimal description on the menu (Loetje’s Hamburger), from past experience this could mean anything, and I’m not sure what my expectations were either. Anyway, the burger. It was outstanding. Fried onions, gherkins, various pieces of grated salad, a mysterious sauce that was layered throughout, a very suculent piece of beef and a soft, fresh, powdered bun. Do I need to say more? It was deceivingly good.